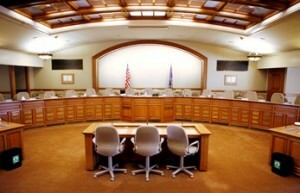 The Legislature’s Joint Finance Committee removed 83 non-fiscal policy items from Governor Walker’s budget proposal, including rules on faculty teaching load and freedom of expression on UW campuses. The committee chairs say the items should be considered as non-budget legislation by other committees. The University of Wisconsin System Board of Regents will meet at UW-Platteville Thursday and Friday, April 6 and 7. All meetings will be held in Ullsvik Hall, 30 South Hickory Street in Platteville. Livestream coverage of the full board portions of the meeting is available here. The Education Committee will discuss several new degree programs at UW-Milwaukee and consider the four post-tenure review policies, including UW-Madison’s policy (below) approved by the Faculty Senate in March. The Business and Finance Committee will review UW System’s annual financial report and consider several contractual agreements, including an Amazon pick-up point at UW-Madison. The Capital Planning and Budget Committee will consider several campus design reports, including the construction of a new Southeast Recreational Facility at UW-Madison. The Research, Economic Development, and Innovation Committee will hear an update from the Wisconsin Economic Development Corporation and a report on industry partnerships from UW-Platteville Dean Wayne Weber. The Audit Committee will discuss best practices letters to chancellors and the 2017 Progress Plan Audit Report. The full board meets Thursday afternoon and Friday morning. Thursday, UW-Platteville Chancellor Dennis Shields will speak on comprehensive universities as stewards of place in their communities. The regents will also discuss UW System accountability and 2020FWD reporting. On Friday regents will hear from UW System President Ray Cross and Board of Regents President Regina Millner. The Board will also present the 2017 Teaching Excellence Awards. University of Wisconsin System President Ray Cross spoke to the Legislature’s Joint Finance Committee last Thursday, March 30. Cross focused on four areas: affordability, accountability, compensation and infrastructure. His prepared remarks are below.